Funding announced today will see the creation of a new engineering training facility at the MIRA technology park and £1m to support the Silverstone Metrology Centre. These are just two of a range of initiatives that from 2015 will benefit from at least £12bn being invested into regional economies across England. The government’s Growth Deals are intended to provide support for local businesses to train young people, create new jobs, build new homes and start infrastructure projects; including transport improvements and superfast broadband networks. According to the government, projects beginning in 2015 to 2016 will be be matched by local investments worth around twice the contribution from central government. Across the country they are expected to lead to work on more than 150 roads, 150 housing developments and 20 stations. In Warwickshire, Growth Deals will help deliver a new engineering training facility at the MIRA technology park that will equip people with the skills to work in advanced transport engineering. A further £1m is being made available to create the Silverstone Metrology Centre, a high precision measurement facility for SMEs working in high performance technology industries including motorsports, enabling them to develop new products. Click here to view a map showing local enterprise partnerships across England. Budding female entrepreneurs are being encouraged to enter a Dragon’s Den style competition aimed exclusively at women. The Women with Bright Ideas Competition has been set up by Engineering Innovation Network – South West (EIN-SW), Wiltshire Enterprise and NT CADCAM to encourage female innovators to turn their ideas into products. Competitors are being asked to submit ideas that could be manufactured, are tangible and commercially viable by July 31, 2014. The organisers stipulate that entries don’t nee need to be at the design or prototype stage and can be submitted as a proposal, as all ideas will be judged on their merits. The successful entrants will be contacted during August to discuss support opportunities to prepare their Bright Idea for a showcase event in October when they will present to a panel of experts and potential investors who could support the product to a commercial reality. Its competition time in Hampshire too, where 12 student teams from three continents are gathering this week for the 2nd biennial European International Submarine Races (eISR) at Qinetiq’s Ocean Basin in Gosport. 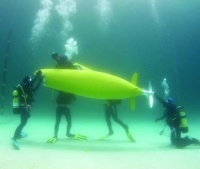 The event, held in the biggest covered water space in Europe, requires student designed and built submarines to be fully submerged and pedalled around a slalom course wearing scuba equipment. Commenting on the event, race director Prof William Megill, FIMarEST said: ‘The overall objective of the eISR is to encourage innovative design in submarine engineering. ‘Past teams, comprised of multi-disciplinary engineering students, have designed a wide variety of exciting machines, propelled either by standard rotating propellers, or by novel non-propeller thrusters. British teams competing in the challenge are from the Universities of Bath, Plymouth, Southampton, and Warwick. EISR incorporates also a one-day Graduate Careers Fair and Underwater Technology Master Classes on Wednesday 9 July. The Fair and Master Classes run alongside the Races, and will consist of a series of presentations by sponsoring companies, who will also have recruiters available to speak to young engineers. Participants in the Master Classes will also be welcome to visit the races. Finally, tomorrow marks the Environment Agency’s consultation deadline on Cuadrilla’s application to carry out exploratory fracking in Little Plumpton, Lancashire. Cuadrilla Bowland announced that it had applied to the Environment Agency in June for relevant permits for their Preston New Road exploratory shale gas site at Little Plumpton. As part of this exploration the company said it plans to carry out fracking in 2015 to investigate the potential for shale gas. Congratulations a very interesting issue.